At CraftMark Bakery, we strive to be leaders in bakery innovation. We always have our finger on the pulse and want you to be the first to know about the next big bakery trend before it goes mainstream. Welcome to What’s Rising—your destination for the latest bakery trends and insights. In our first blog post, we highlight the hottest bakery trends from 2017 and share our predictions for the year ahead! From snacking to clean labels to healthy grains and pulse flours, 2017 was full of diverse and exciting opportunities that will continue to impact our industry for years to come. Dairy-free, gluten-free, vegan, low-sugar—the free-from trend has made its way to the baking segment. As health and wellness becomes a priority for many Americans, the demand for transparency and healthy, better-for-you ingredients continues to grow. 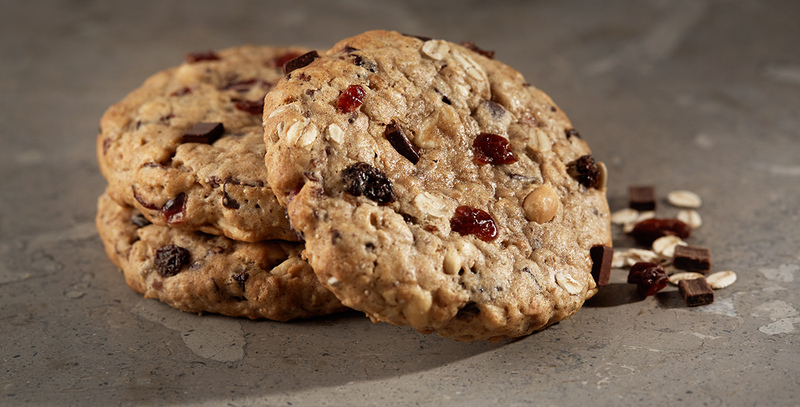 Today’s consumers want simplicity and recognizable ingredients and are even willing to pay more for products with 12 or fewer ingredients.2 From protein-rich cookies to plant-based pastries, healthier desserts and baked goods are here to stay. With the demand for healthier bakery items, it’s no surprise there was a huge spike in the use of ancient grains and pulse flours derived from ingredients like spelt, sours, rye, chia, kamut, teff, quinoa, sorghum, peas, chickpeas and lentils. Grand View Research expects pulse flours to have a compound annual growth rate of 14.5% within this segment from 2016-2024. Cookie dough, éclairs and over-the-top milkshakes were just a few of the nostalgic desserts that started popping up on menus with modern, indulgent twists. At Patisserie Chanson in New York City, Chef Rory Macdonald adorns the classic oblong éclair with a rectangular chocolate ornament that hints to the flavor inside. Chef Rory’s éclair flavors include Stumptown café au lait, Sicilian pistachio and blood orange. Meanwhile, shops and restaurants featuring raw cookie dough and Instagram-worthy milkshakes drew huge crowds throughout 2017. Sustainability and functional ingredients will lead the way in the bakery and desserts trends this year. Meanwhile, the classic donut will get a modern, grown up makeover and chefs will experiment with nontraditional ingredients and savory flavor profiles. From sourcing to packaging to processing, sustainability will have a huge impact on the bakery industry. A sustainable supply chain is now critical to the success of commercial bakeries. Manufacturers who work with suppliers to develop a more sustainable supply chain will be better equipped to cut costs, manage risk, generate new sources of revenue and boost the value of their brand. In addition to a more sustainable supply chain, recycled and eco-friendly packaging will be essential to attracting conscious consumers. As the better-for-you ingredient trend continues to evolve, consumers will seek out functional ingredients that offer multiple health benefits such as anti-inflammatory and antioxidant properties. Functional mushrooms such as reishi and chaga will start popping up for their high fiber, immune boosting properties. Derived from an ancient form of intermediate wheatgrass, Kernza provides a similar nutritional profile to wheat and can be easily substituted for it in a wide variety of products. Powdered blue algae, aka Spirulina, will be used for both its nutritional and unique coloring properties. Unripe bananas may not seem like the next big superfood, but when they’re turned into flour, their benefits become apparent. Extremely high in resistant starch and inherently gluten-free, green banana flour is expected to be big in 2018. Perhaps a result of the clean label trend, classic dessert recipes are being updated with nontraditional ingredients and in some cases are taking on savory flavor profiles in place of sweet. This year will showcase desserts made with less sugar, more spice, hearty grains and even naturally sweet vegetables, like beets. Vegetables, in particular, will appear more often in place of fruit due to American’s growing concerns over sugar content.6 Complex nutty flavors like brown butter and burnt caramel are also expected to become more prominent this year. While 2017 seemed to be the year of better-for-you bakery ingredients and modern versions of classic recipes, 2018 appears to be taking those trends even further, with sustainability, functional ingredients and grown-up flavor and nutritional profiles taking center stage. As we watch these trends continue to evolve, it will be interesting to see how they impact the bakery and dessert industry. We’d love to hear your thoughts on the latest trends, what you’re most excited about and any challenges these new trends might present. Let us know in the comments section below.